A visually striking map of Geneva, Switzerland. This is a beautifully colored 1900 Charles Bobillier city map of Geneva, Switzerland. This map illustrates the city of Geneva in detail, labeling all the major streets and bridges, and the surrounding area. The parks and gardens are also labeled. The districts within the city of Geneva are marked, as well as the surrounding towns and villages. The two rivers which flow through Geneva, the Rhone and the Arve, are also shown. The railroad lines between Geneva and Lyon, France and between Geneva and Lausanne, Switzerland are depicted and delineated in red on the left side of the map. There are several interesting locations marked on the map, including the 'Beau Séjour' hydrotherapy retreat. 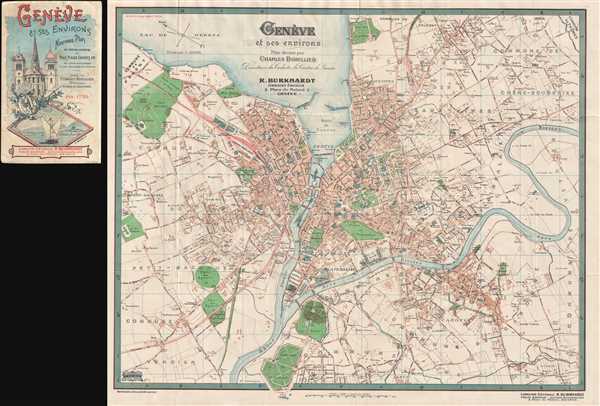 This map was published to accompany an included guide to the city of Geneva. The cover of the guide is here illustrated to the left of the map. The guide lists several hundred locations, which are numbered and appear on the map, and includes several advertisements for restaurants, universities, and tourist locations. This map was drawn by Charles Bobillier, Directeur du Cadastre du Canton de Genève, engraved by Felix Renaud, and published by R. Burkhardt, for his Geneva based English, French, and German language bookstore. Bobillier, C., Genève et ses Environs Nouveau Plan, (Geneva: Burkhardt) 1900. Very good. Minor wear along original folds. Blank on verso.